Terror Group Gets 'A' Rating From Better Business Bureau? The Better Business Bureau, one of the country's best known consumer watchdog groups, is being accused by business owners of running a "pay for play" scheme in which A plus ratings are awarded to those who pay membership fees, and F ratings used to punish those who don't. "Right now, this rating system is really unworthy of consumer trust or confidence," said Connecticut attorney general Richard Blumenthal in an interview to be broadcast as part of an ABC News investigation airing tonight on 20/20. In an official demand letter sent to the national headquarters of the Better Business Bureau Thursday, Blumenthal called on the BBB to stop using its grading system, which he said was "potentially harmful and misleading" to consumers. "The BBB accreditation and the BBB ratings systems is not about generating money," said BBB national president and CEO Steve Cox. He said the A minus grade for Hamas was given in error. "Plain and simple, we made a mistake," Cox told ABC News. 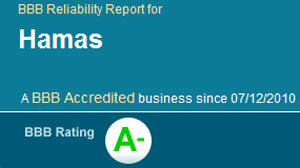 Errors seem to abound at the Better Business Bureau. As reported by an anonymous blogger the BBB also awarded an A minus rating to a non-existent sushi restaurant in Santa Ana, California and an A plus to a skinhead, neo-Nazi web site called Stormfront. "They ran the credit card and within 12 hours they were an approved, accredited member," said the anonymous blogger, who runs a site called bbbroundup.com. "They're more interested in the money than their credibility," he said. The BBB's Cox said the three listings were all mistakes made by sales people. "That's an inaccurate statement that business people are able to buy A's," Cox said. "We have more than 500,000 non-accredited businesses who have A ratings," he added. Better Business Bureau: Pay for Play? Yet, as part of the ABC News investigation, an ABC News producer with a camera was present as two small business owners in Los Angeles were told by Better Business Bureau tele-marketers that their grades of C could be raised to A plus if they paid $395 membership fees. Terri Hartman, the manager of a Los Angeles antique fixtures store, Liz's Antique Hardware, was told only a payment could change her grade, based on one old complaint that had already been resolved. "So, if I don't pay, even though the complaint has been resolved, I still have a C rating?" Hartman then read off her credit card number and the next business day the C grade was replaced with an A plus, and the one complaint was wiped off the record. In a second case, Carmen Tellez, the owner of a company that provides clowns for parties was also told she had to pay to fix her C- grade, based on a two-year old complaint that she says had already been resolved. The C minus became an A plus the very next day after she provided her credit card number for the $395 charge. "If I'm paying for a grade, then how are the customers supposed to really trust the Better Business Bureau?" she asked. Cox said the examples provided by ABC News were violations of sales policy and not a standard way of doing business. "The BBB is not operating fraudulently," Cox said. In his demand letter to the BBB, the Connecticut attorney general said, "I am deeply concerned that certain BBB practices threaten its reputation and effectiveness as a reliable resource for consumers." Allison Southwick, media relations manager for the BBB, said that the BBB had worked with Attorneys General across the country, including Blumenthal, to fight fraud. "We disagree with his characterization that BBB does not adequately disclose the fact that Accredited Businesses financially support BBB," said Southwick. "However, we are always interested in hearing from our partners in consumer advocacy and are pleased to accept constructive feedback from his office and other consumer advocates." "We have made good progress in working with his office on these issues, and anticipate that we will satisfactorily address his concerns," said Southwick. The Better Business Bureau, a non-profit group that began 98 years ago, instituted its A plus through F grading system just two years ago, replacing a "satisfactory/unsatisfactory" ratings system. One of the first to raise concerns about the new grading system was New York Congressman Anthony Weiner. Weiner was investigating complaints to his office about the popular precious metals dealer Goldine. Some customers had alleged they were ripped off after responding to Goldline's television ads, which appear in heavy circulation during conservative talk radio and television programs. Goldline responded to Weiner's criticism in part by pointing to the stamp of approval the company had received from one of the nation's most respected consumer groups. "We are proud to be rated A+ from the Better Business Bureau," Goldline VP Scott Carter said at a congressional hearing convened by Weiner in September. Weiner told ABC News he considered Goldline's A plus grade to be suspect. Weiner and other critics say they believe the BBB has used the new grading system as part of an extensive tele-marketing campaign to increase membership and revenue. An ABC NEWS examination of filings with the federal government revealed that at least 25 of the Better Business Bureau's top officers had salaries in excess of $100,000. The head of the Los Angeles Better Business Bureau, William Mitchell, was paid more than $400,000, according to the Better business Bureau. "I think the Better Business Bureau changed course and lost its way by adopting a system of pay to play that maybe enhanced its revenues but also greatly diminished its credibility and honesty," said attorney general Blumenthal, who was elected to the United States Senate from Connecticut last week. "It's very troubling and it could be illegal because the failure to disclose to consumers could well be deceptive and misleading," he added. The ABC News investigation found numerous examples of well-known companies that are not members of the Better Business Bureau being branded with F grades, often apparently based on scant evidence or a small number of complaints. The five-star Ritz Carlton Hotel in Boston was given a F rating after only two complaints. "A million customers served, two complaints resulting in an F rating, seems to be somewhat unusual, to say the least, " hotel general manager Erwin Schinnerl told WCVB-TV in Boston. Celebrity chef Wolfgang Puck told ABC News that parts of his food and restaurant empire have received an F grade because he refused to pay to join the Better Business Bureau. "You know, if you become a member, you're sure to get an A, but if you don't pay, it's very difficult to get an A," said Puck, who has been a regular on the ABC News program "Good Morning America" since 1986. "I think where you have to join an organization to get a good grade is wrong," Puck said.